Danida – One Billion Hungry: Can We Feed the World? 2. To strengthen African agricultural innovation systems, which are expected to deliver the new and improved technologies that are required to improve agricultural productivity. 3. To develop and implement improved and better contextualised undergraduate and postgraduate agribusiness teaching and learning. 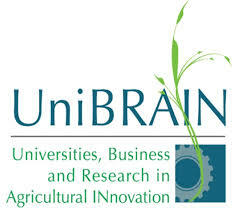 It is pursuing these objectives through the development of UniBRAIN Agribusiness Innovation Incubators, centres that provide training, research and advice to small and medium enterprises (SMEs), both new and existing, as well as business development services. Their value chain approach means they act to support innovation at every step of the agricultural chain from farmers and producer organisations to input suppliers, marketers and processors. Specific services offered include mentoring and training programmes, access to agricultural research, technology packaging and dissemination, advice on customer, product and business model development and networking between businesses.